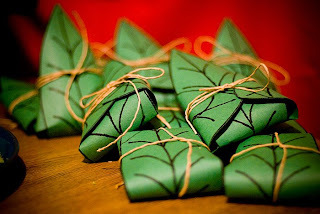 For those who don't know, lembas is a special bread made by the elves of the Lord of the Rings series. It's shaped into thin cakes and because of its filling nature it's usually used for sustenance on long journeys. Generally wrapped in Mallorn leaves, not much else is known about the ingredients. The bread is supposed to be brown on the outside and cream colored on the inside, sort of like a flat bread, and tastier than most other cakes in Middle-Earth. You can find a template for mallorn leaves and a alternate recipe here. These would probably make great party hors d'oeuvres if you're nerdy enough to have a LoTR themed party. Which you probably are. Dork. Put the eggs, butter, honey, kumquats, rose or orange flower water, and nuts in a food processor or blender. Blend on high for 2-4 minutes. Add 1 cup of the flour. Blend for a minute or two. Put mixture into a bowl and add the remaining flour and the salt. Whisk or stir until well blended. Bake a small amount of dough (about two tablespoons) at a time on a pizzelle or iron about 15 seconds or until lightly brown, for a flat bread like texture. They can also be baked at 350 degrees for about 10-15 minutes. Wrap in a leaf and tie with a string! I love this. I am so nerdy enough to make these. Made these for my son's school project. I kneaded the dough with additional flour until it was not sticky. Rolled and cut the dough, brushed it with melted butter. Baked it on parchment for 10 minutes in a 350 degree oven. They were great, nice flavor. The texture is a cross between a cookie and a biscuit. Thanks for the recipe. how much flour did you use to make it as a dough an not pancake related batter? you keep using that word. i do not think it makes you sound as smart as you think it does. omg invite me to that party! I think they're referring to 'the latter'. Dôl gîn lost. Uhunc ylf ernedui. Uber Geed =] and Caleb Lauth, what does the Elvish translate to? It translates to "May Elbereth protect you, may her stars shine on the path of your life." If only I had found this site a few hours earlier! I made my first attempt at lembas bread using a skillet scones recipe and subbing in some cornmeal (since my boyfriend was the recipient, and he always imagines lembas as a sweet, dense cornbread) and topped with honey. I always thought of lembas as cornbread too! I always thought of it as more of a pop-tart.. probably just me though. I loved making this! Though I made it with apricots instead of kumquats because we just couldn't find them. But they came out wonderful! My classmates are going to be very happy during our Epics party tomorrow! And I was just wondering if you could do a Doctor Who Banana Daiquiri recipe. If you don't know the reference see season 2 with David Tennant and The Girl in the Fireplace is the episode. Thank you! I imagined lembas bread to be full of whole grains and seeds...will try your recipe tomorrow tohumor my 9 yp!! Yeessss, these sound really awesome. Thanks for sharing. I'm making a bunch and taking these LARPing with me. I was thinking of the same thing Anonymous...LARPing time with Lembas!!! :D I'm about to make these - very excited - and just noticed that there's no instruction for the melted butter. Comments before mine give some clue and I'm sure it'll still come out tasty no matter what I do with it, but what did you do with it? guess what! I am having a nerdy LoTR dinner party this Saturday. 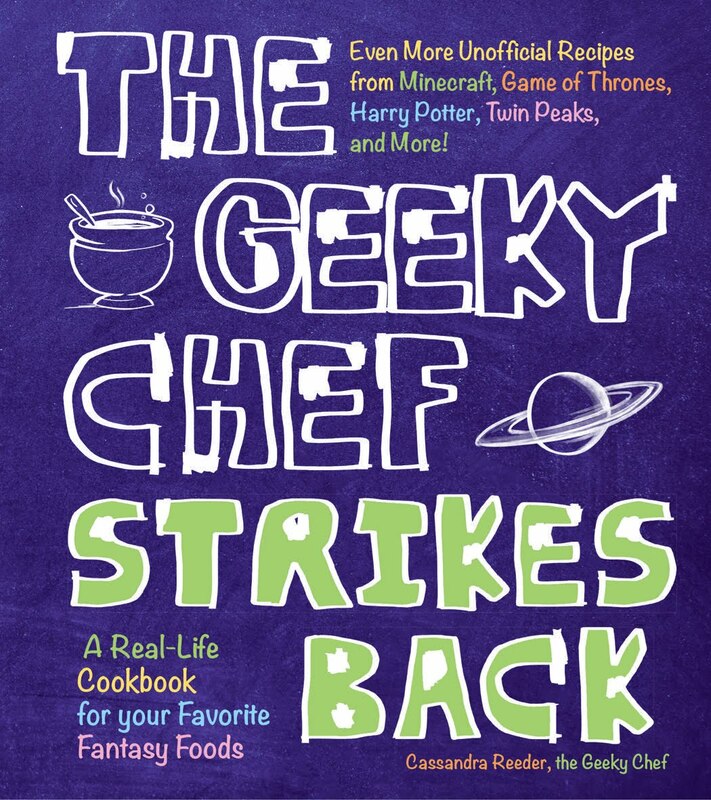 The entire menu is based around recipes adapted from the book. My Middle Earth Menu! These leaf-wrpped waybread will be perfect! Costumes, decorations, lighting and food... can't wait to get my nerd on! 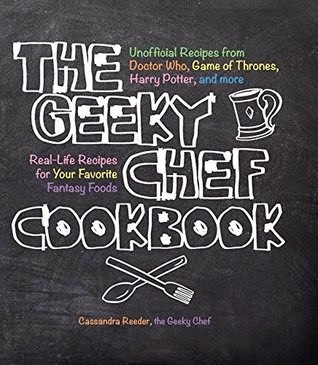 Ooh, these sound interesting -- me and my boyfriend are huge LoTR fans and we were talking about a Lembas recipe today. I'm gonna have to try this now! I am personally making, from scratch, all 7 Hobbit meals, with foods inspired by the LOTR culture. I am going to try my hand at lembas bread....I am going to try the apricots(no kumquats)...hope it goes well, thanks for the recipe! I'm so making this! I'm going grocery shopping today and I'm definitely buying all the ingredients! I would love it if you did a Doctor Who Fish Fingers and Custard recipe. That'd be interesting! Fish sticks and custard are interesting together... Not great, but certainly interesting. There's a recipe on here for Fish Fingers and Custard now! You could just get Wheat Snack Bread from MREs. Im certain it is about the same. Made this with physallis instead of kumquats, and hazelnuts instead of macadamia. Trust me, it'll be the best thing you will EVER eat. I'm pretty sure the cram you're thinking of is the horrible biscuits that Thorin & Co. had to live off of on their journey up the Misty Mountain. What could you substitute for kumquats? I usually get couple of those small limes that you find in baskets at the grocery store near the beer. I use their juice and call it a day. Kumquats are a citrus-y fruit, so I figure that the lime juice gives you the citrus bite, even if it is not the same flavor. I have done this with both the orange flower water and the rose water. It tastes better with the orange flower water, but still tastes good with the rose water. Is there anything I can replace the eggs with? When I'm replacing eggs to make a recipe vegan, I often substitute bananas or applesauce. I haven't tried that for this recipe, though, so I have no idea if it would work! How do you add the kumquats? add pieces to the mix or do you squeeze some of the juice into the mix? i think i will try this. yeah i am a nerd (is a nerd and geek different?) so i will definitely try this, although i probably wont be having a LOTR themed party anytime soon lol, i could just make them for myself. i came here when i googled "Elvish food" i found a website called CouncilofElrond.com where there are a LOT of Middle-Earth inspired recipes :) and the Elvish ones look great but i decided to see what other recipes on other sites were. this one looks good, i wonder if i had my mom try one of these what she would think. lol she would never guess its from LOTR cause she never read the books or watched the movies. When does the butter go in? With everything but the flour in the food processor. Fixed that error! I wish these were really filling like in LoTR, so they could last all my hitch hiking trip to Boom Festival 2012! I think this recipe is awesome! going to see the hobbit premiere with some friends (in costume of course), and am definitely making these. You could actually, instead of using foam/paper/whatever, use real leaves. bamboo leaves that my grandmother uses to make zongzi (http://en.wikipedia.org/wiki/Zongzi) may not have the same exact pattern, but at least it's a leaf. Cook for 15 seconds? Don't get me wrong, I love raw cookie dough and all, but shouldn't this be cooked a bit longer what with the egg and all? Hi there! That's only if you're using a pizelle iron to cook it like a flat bread, it is extremely high temperature. If you're baking them, around 10 minutes and 350 degrees. Excuse me but when do put the butter into the recipe? With everything but the flour in the food processor. Fixed that error on the post! Thanks for pointing it out. Wow I wish I had looked this up before the midnight premier of The Hobbit. I would've given it to everyone who dressed up! You can use the whole kumquats. Kumquats do not have to be deseeded if they are fully ripe, they can be eaten whole. The peel is much sweeter and less bitter than the orange or lemon peel, and adds a lot of citrus flavor to pastries. Can i use walnuts instead of almonds? Do I just put the whole kumquat in or do i peel them and cut them? You can use the whole one! The peel adds a lot of flavor and it isn't as bitter and orange or lemon peel. I have been wanting so badly to know what this stuff would taste and feel like ever since I was real little. I kinda thought it would taste and feel like bread in MRE's, since that was my only basis for comparison. I can't wait to try it! my brother emailed me the link to this and asked me to make it for him because we both love LOTR so I am going to attempt it tomorrow if I can find rose water... hopefully. Orange water could also work! The fruit of the Mallorn tree is actually a nut. You are absolutely right, thank you for pointing that. Fixed! It's definitely been a while since I read the books. I always imagined lembas as tasting like an almond biscotti or something. As much as I hate chocolate, it is the human food most similar in properties to Lembas bread (when they were exploring the North Pole they brought chocolate as the main calorie source, as well as it generally being a military ration due to these properties) so I was really expecting to find some chocolate here. Has anyone tried this recipe as a means of survival? I am curious if it works. I made these but they came out all rubbery? They tasted good but weren't at all like cookieish texture...more like really thick pancakes... did I do something wrong? Forgive my ignorance (I'm Irish), but by "c" in the measurements, do you mean a cup? All ml over here. I haven't made this but I would want it to be very dense and VERY crisp. When they bite pieces off in the movies it's most definitely NOT a biscuit or cake or any other such soft texture. It should be closer to old fashioned pioneer hardtack or hard salt sea biscuits. They had a crispy cracker like bread in the movies, but it was soft on the inside in the books. This is not lembas. It wouldn't last a week in the wild. What about honey? I wonder if 1 c. (it means 1 cup, right?) isn't too much. Isn't it too sweet? the lembas was good. It made me think of a orangey pancake. i really liked them when i added honey on top. i thought elves were vegans, whats up with the eggs? Could you give a link to a paper print out for the leaves? That would be great! Tried these and they were awesome! I did substitute cranberries and orange zest for the kumquots and orange flower/rose water. Thanks for the recipe! Could you make a recipe for Cram, or a recommendation for a close substitute? Also, what kind of leaves do you recommend wrapping them in? The only common thing large enough in my area would be Hickory, but I fear the taste might rub off. Hmm. Any paleo/primal recipes of Lembas Bread? I imagine anything cooked or baked by Elves fits the very definition of Primal-Paleo living! I suppose it's okay for them, since they're immune to all diseases. But yeah, almond flour would probably work, or coconut flour, if you don't want to go overboard on the omega 6 found in nuts. these sound lovely with the honey and kumquats. I cant wait to try this, i am such a lord of the rings geek and this sounds delicious. Does any one know how many pieces this recipe will make? Any suggestions if one doesn't have a pizzelle? Or does iron refer to a waffle iron? My sister and I made this for my friend's birthday, and she loved it! Used the orange blossom water instead of the rose, and made two batches - one with macadamia nuts, one with almonds - couldn't tell the difference between them, would recommend just going with the almonds, as they're cheaper. She loves icing, so we made some icing as well with the orange blossom water (just make regular white icing, and instead of using vanilla extract, put in the orange blossom water for flavouring). Tasted great! We used the icing as a dip for the lembas, and also used honey as a dip. Delicious! Would definitely recommend this recipe. Baked in the oven for about 10 minutes at 350 F, lembas came out with a chewy cookie-like texture.